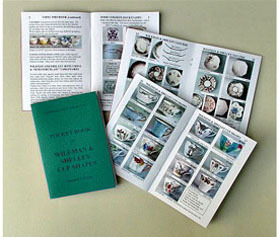 colour pictures of all known china cup shapes for Wileman & Co. and Shelley Potteries, including several new shapes, found since the first edition. Wileman & Co, Shelley and J. F. Wileman earthenware cup shapes. Information about dates of manufacture, diameters of tea cups and the correct matching saucer shapes. Pictures of a range of Wileman and Shelley horns, beakers and mugs. Pictures of common backstamps and the dates they were in use. An outline history of the Wileman and Shelley Potteries.